Sybil Andrews was part of the Grosvenor School in England, a group of artists working in linocut who were influenced by the exciting modernist movements of Futurism, Vorticism and Cubism. 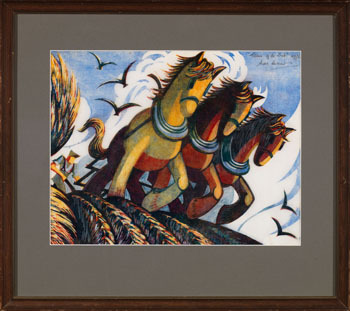 In the 1930s, harsh economic realities brought a new appreciation for the working class, both rural and urban, who emerged as a subject for art, and their energy and productivity was seen in a heroic light. Tillers of the Soil is from a group of linocuts in Andrews’s oeuvre that embodies this subject. Seen at a distance, the figure of the farmer is small, but his stance at the plough is self-assured as he controls the team of massive draft horses. 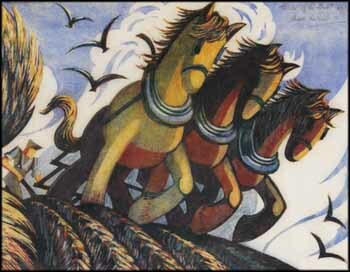 Andrews emphasized their power through her unusual use of perspective, showing the horses looming over the top of the hill with the stylized furrows of the field plunging downward below them. A pervasive and dynamic sense of movement, strong colour, and the bright light of the open farmland make Tillers of the Soil a powerful image. This print is an impression on oriental laid tissue with strong colours and does not have full margins.